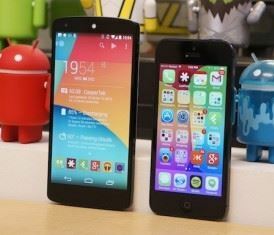 Android L and iOS 8 are set to see a fall release this year bringing up the regular Google vs Apple battle. This year is specifically more heated as Google has shifted its design focus to an entirely new era with Material Design. On the other hand, Apple made this shift last year with introducing minimal, flatter design philosophy for iOS 7. Apple is expected to make its iOS 8, thus, more features-rich than design-focused. The two new versions of rival tech giants do deserve a side by side, Android L vs iOS 8 comparison based on whatever we know so far. This post is no way trying to take side of on mobile OS over the other considering the definite differentiating points of the both OS. However, you are free to stay on whatever territory you are as we are all well aware of how a mobile consumer is supposed to be either a crazy Apple fan or a maniac FAndroider. One thing that was apparent in Google I/O this year was a focus on Material Design, introduced at the conference itself. From Android Wear to Android L, Google is gearing towards a complete ecosystem design shift. Offering consistency across Android, Chrome OS, Desktop, Chrome browser, and the Android Wear, Google aims to offer a user interface that is aesthetically clean and uncluttered. Deja vu? Yes, Apple also shifted to a minimalistic look with its last year’s iOS 7. Be it a user feedback based change or that the cleaner look seems to be in fashion, the UI offered by both the tech leaders is based on the same basic principle: simplicity. We will experience the Android L more when it is released, but from what we can see now it is packed with contrasting colors, bold images, new typography, and added layers to the entire design language. On the other hand, iOS 8 will retain the looks of iOS 7 fixing and improving a little here and there based on the past year’s experience. Android L has an increased focus on Notifications with an aim to give user a seamless interaction with the device using notifications. As opposed to earlier, Android L features the notifications right in the middle of the screen (much like iOS 7). You now don’t have to pull down the notification panel to read them. Swipe to dismiss it and tap twice to launch the particular app. While iOS devices light up for a few seconds to help the user read the notifications at a glance, Android L doesn’t follow that route. When a notification arrives on Android L, the RGB notification light will go off to help user get notification. Another thing that would be appreciated on iOS 8 is the added options: swiping can let you reply to an email increasing the ease for users. 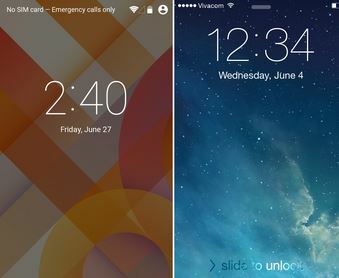 Both Android L and the iOS 8 lock screens have a short cut of camera – I totally appreciate the existence of that one! But the Android L lacks a shortcut to the phone app to dial a number as easily as possible. Android L home screen is pretty much same to what we see in the Android 4.4 KitKat featuring the Google Now, folders, widgets, etc. iOS 8 is also keeping the home screen same to iOS 7 as it isn’t going into major design change. One interesting development in both operating system is the third party widgets. While Apple finally is open to third party widgets in the notification panel, Google has stopped supporting the lock screen widgets, perhaps to make the lock screen uncluttered. Many comment that Apple opening its arms to third party widgets is due to users loving Google’s, it is yet to be seen how Android L’s lack of widget-support is taken by the end user. For one, it would definitely help in cleaning up the entire lock screen look. Android L significantly improves the notification panel by sorting the notifications with their priority order so important alerts get pushed up to the top. iOS 8 on the other hand classifies notifications under the tabs of different applications. The order of how these apps appear in the panel can be changed from Settings though. Coming to the Quick Controls menu, iOS 7 made our lives easy giving us the ability to access quick control menu from any screen whatsoever. Filled with all the basic quick controls including brightness, WiFi toggle, music playback, Bluetooth, Camera, etc, iOS 8 will keep the Quick Controls as it. Android L is introducing a redesigned Quick Controls menu that is now accessible from the pull-down panel like before. The Android L Quick Controls menu now is stuffed with some basic controls that were lacking earlier including brightness slider and screen orientation lock. Moving away from the column of recent apps, Android L now features a redesigned interface for apps in the shape of a stack of cards, yep! While this is better looking and intuitive, the screen only shows 3 cards at a time requiring you to scroll down. iOS 8 will better the current multitasking scenario by listing the apps in a chronological order with their icons on a separate row. iOS 8 multitasking menu will also feature a very helpful list of the most frequently contacted contacts to help user perform the basic contact functions quickly. iOS 8 Photo app works as the gallery and editing platform for the OS. You can sort the images by time and date and back up easily to the cloud for storage. iOS 8 also packs quite a few editing skins for photos that though aren’t as extensive, perform the basics quite cleanly. Android L photos are also viewed in the Photos app where they are stored in two different tabs: one that stores all the images and another titled Hightlights carrying a few images organizing them by date. Like iOS 8, Android L too offers automatic back up to cloud and offers editing tools. 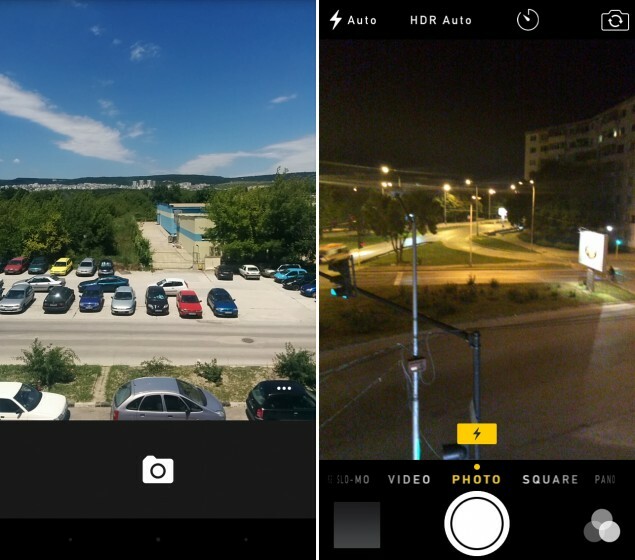 Unlike iOs 8, Android L’s editing tools are quite varied and extensive packed with image filters, frames, basic functions, and effects. Very easy to play with to get some good results on your image. Google has started offering its voice commands for search with OK, Google command. OK Google works seamlessly from any home screen and with a recent update for Search app, the command can be used from any screen including the Lock screen. 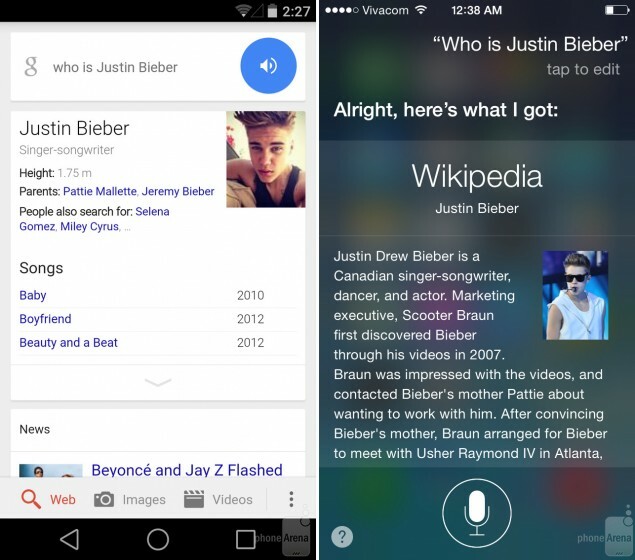 iOS 8 too has an equivalent of OK, Google with its Hey, Siri voice command for search function. However, iOS 8 only works with the aforementioned command when the device is plugged into a power source, which is pretty useless. 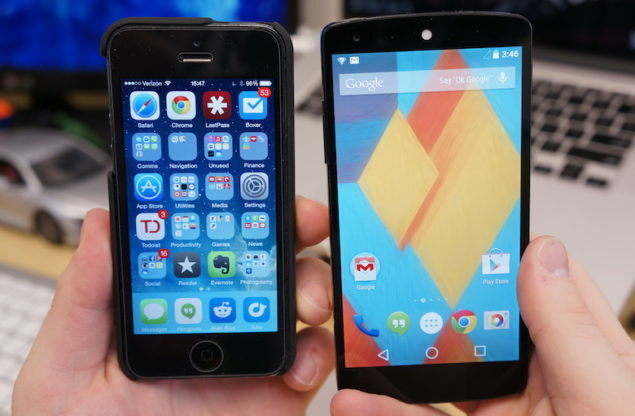 All in all, both the Android L and the iOS 8 look promising in their beta versions. However, this year Google’s Android L will definitely get more attention due its complete design overhaul and introduction of having a consistent design philosophy through out the company’s services. With a visual treat and added layers in to the design, Android L is definitely going to win the hearts of its fans. iOS 8, on the other hand, may not be introducing a visual redesign, but it doesn’t need one considering only last year it got a complete revamp. Apple’s opening to third party widgets will remain a highlight which opens the iOS devices to a pretty vast array of services and features that will keep us engaged with the OS’s interesting proceedings. iOS 8 is expected to be released with the iPhone 6, probably in September; Android L is expected to be a little late with a pre-Christmas release on a new Nexus. 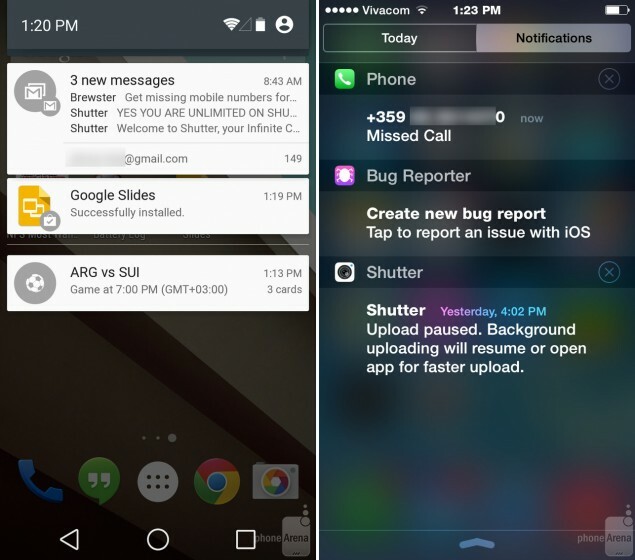 Let us know what is your favorite feature of Android L and iOS 8 and which feature would you prefer getting some focus?